Share the post "The Landmark Hotel London is looking for new talents at Les Roches Hotel Management School"
For the 6th year in a row, Les Roches International School of Hotel Management had the pleasure of welcoming the General Manager and the Human Resources Director of the Landmark Hotel London to recruit students and future graduates. Since 2006, Douglas Glen, General Manager at Landmark Hotel London is coming every year to recruit new talents from Les Roches. He is looking for 40 interns and six to eight graduates per year. When he travels to Switzerland, he also visits other hospitality management institutions like Les Roches’ sister school Glion Institute of Higher Education. 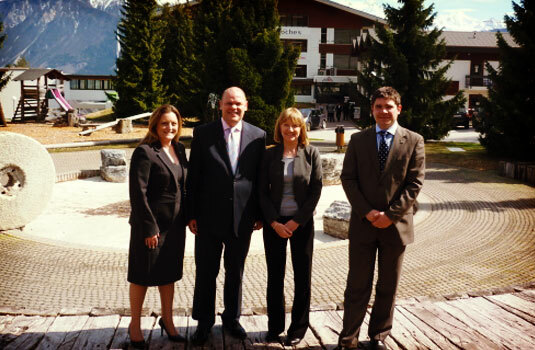 In one day in Les Roches, Mr. Glen and HR Director Mrs. Nicola Forshaw had 24 interviews planned. ‘We are looking for students with passion and enthusiasm driving them to the hospitality industry’ comments Ms. Forshaw. ‘Here in Les Roches, they are well educated and hungry to work in hospitality. Our international guests enjoy them very much’ added Mr. Glen commending the almost 100 different nationalities present in Les Roches. ‘The Landmark Hotel is a privately owned company allowing students to fully develop their talents for the future’ said Mr. Glen. Students experience a tailor-made internship according to their competences and needs. They can work in different departments like marketing, F&B, finance, etc. ‘In other brands, the corporate trainings can be very rigid sometimes’. In addition, the hotel manager appreciates the innovative point of view of the students regarding subjects like social media, green issues or sustainability. ‘The students bring a different perspective to these kinds of subjects. We even won the Gold award on sustainability thanks to a student who started to work on the project’. The venue of young energetic students also motivates the employees to work even better, every day. The Landmark Hotel manager has a famous mentor in Sir Alex Ferguson, the renowned Manchester United coach. ‘He coached me in my career giving me tips on how to manage a team’. Indeed, the hotel manager compares his employees to a football team. ‘In a hotel, you have the same positions as on a pitch, the goalkeeper, the front etc. In addition, both share the same values such as leadership, communication, consistency, training, etc. I ask my interns to give me examples of all these values in each department they go through to share best practice.’ And of course they get to meet the legendary Manchester United coach and the team who stay at the Landmark each time they play in London. ‘We are delighted to be associated with Laureate and we hope to continue recruiting new talents in your institution in the future. Your schools become great ambassadors for us, for example in GIHE you have a fully branded Landmark classroom and this helps to spread the word’. The Landmark Hotel London is among the 100 companies visiting Les Roches every year to recruit its talented students. This year only, brands like Mandarin Oriental Hyde Park London, Louis Vuitton, Ritz Carlton, Hyatt, Four Seasons, Disneyland Paris, Orient Express Worldwide, Moevenpick Hotels & Resorts, Marriott International, Rezidor, and many more, have come or plan to come recruit Les Roches students for internship or future employment. Les Roches graduates are highly appreciated by the hospitality industry. Each student has on average three job offers upon graduation and 90 percent of the students have secured employment the moment they graduate. From left to right: Mrs. Nicola Forshaw, HR Director, Mr. Douglas Glen, Hotel Manager Landmark Hotel London, Mrs. Joanne Norris-Smith, Career Development & Industry Placement & Mr. Matthieu Mioche, Career Placement Manager for Les Roches.